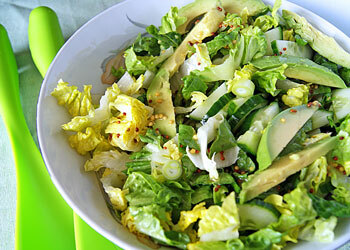 This avocado salad recipe is a visual delight with its beautiful mix of salad greens with avocado. But the best bit of all is that it tastes as good as it looks with its light and tangy vinaigrette dressing. Beautiful salad greens don’t need a rich, heavy mayonnaise. A delicate vinaigrette with a bit of a tang is all they need to enhance their flavor. By keeping it simple the vegetables become the star of the show. Wash and dry the lettuce. A salad spinner makes this job easy. I used baby cos for this recipe because of its sweet, tangy flavor. Roughly chop the lettuce into bite-sized pieces. 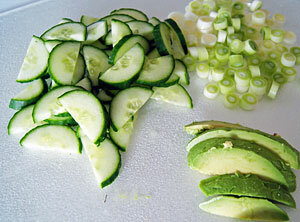 Cut the cucumbers in half lengthwise then slice. Slice the onions. Peel and slice your avocados. 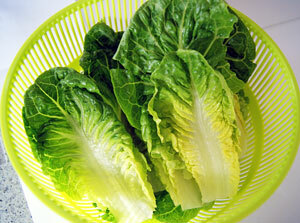 Place the lettuce, onion and cucumber in a bowl and toss lightly to mix the ingredients together. Add the vinaigrette dressing and toss to combine. Now add the avocados. Because the avocados are so soft I recommend adding them after you toss the salad so they don’t break apart. If you like you can drizzle a little of the dressing over them to give them some flavor. Place the oil, vinegar, mustard and sugar in a screw-top jar. Secure the lid and shake vigorously until all the ingredients are combined. Contrary to popular belief avocado is not fattening. It contains monounsaturated fat rather than saturated fat and speeds up the metabolic rate. Rich in vitamins and minerals avocado is one of nature’s super foods. Because eating avocado leaves you feeling full, you’ll be less inclined to binge on foods containing sugar or saturated fat.